You can never have enough jumpers this weather, and this stylish dip dye batwing number is far too irresistible, not to be missed! Great for creating an effortless style for your day wardrobes this design will not only give some oomph to your casual wear but it also manages to keep you nice and cosy too. This design features a striking dip dye effect to the lightweight soft fabric. It is incredibly comfortable to wear and the shape is modern and fresh with a loose oversized fit that is super popular right now, a casual crew neck and three quarter length sleeves. 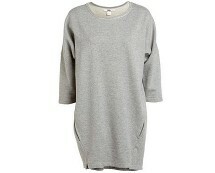 This dip dye batwing jumper is the perfect partner for skinny jeans or leggings and shoe boots. Try dressing it up with wet look leggings and chunky bold accessories for casual nights out and see how versatile it can be! Otherwise lounge around the home in comfort and style and look the part! 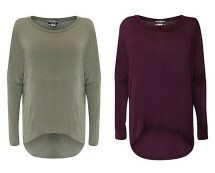 This dip dye batwing jumper is to die for and the perfect partner for some skinny jeans on a chilly day. Approx length 60cm/23.5" (based on a S/M sample). 65% Cotton 35% Polyester.